Set out wine glasses for serving. Add two pear wedges and two cherries (without the stem), one and tablespoon of anise syrup to each cup. Then fill each cup half-way with sparkling wine. 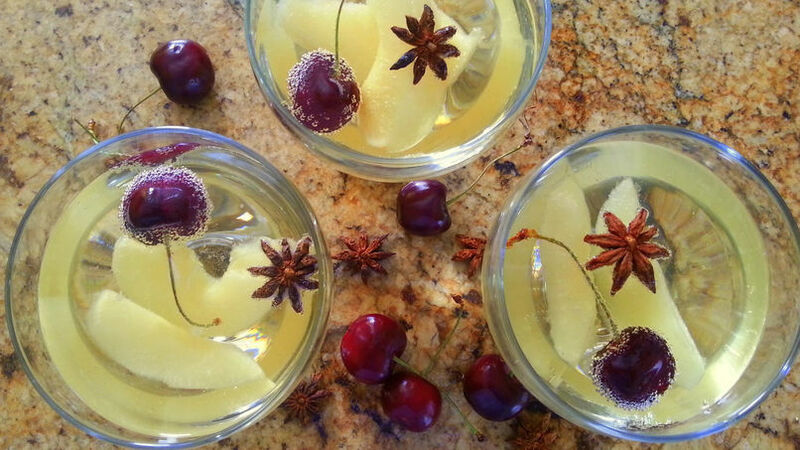 If you like, garnish each glass with an anise star. Serve well chilled. You can enjoy this cocktail with an appetizer of cheese, bread and crackers. You can also use a Muscat or dessert wine in the recipe if you wish. The anise syrup can be prepared and chilled the day before. Sangria is a very refreshing and versatile drink; to prepare it you can use red, white or even sparkling wine to change the flavors. This cocktail is delicious and elegant—appropriate for any special party. Let’s cook!